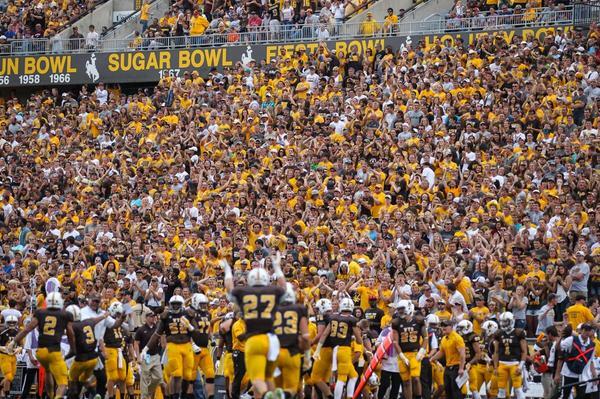 Wyoming celebrates a blocked punt in front of a packed War Memorial Stadium last Saturday. All right, it is Howdy Doody Week! Which means it is time we make ourselves more familiar with particular players who could have a substantial impact on Saturday nights results. The Cowboys (1-0) are coming off a 17-12 victory over (#4 FCS) Montana. It was mostly what we expected as far as style and I think everyone was pleased to see the defense flying around and making tackles and our running backs were broke down Montana’s defenses. In the past few years Wyoming has found itself on the other side of the spectrum more often than not. This week the Pokes will face off against conference rival, Air Force Academy. Air Force (1-0) is coming off a very easy win over Nicholls State, 44-16. They did exactly what you would expect an Air Force team to do. The Falcons ran the ball 73 times for 539 yards, while only attempting 6 passes. Wyoming walked away with a convincing win last season @ Air Force, but a lot of people are expecting to see an old school style game under the lights at War Memorial and this one should be a little closer. Both teams are going to want to set the tone with their run game and feed off of that. It may be worth noting Air Force has won its last 4 games in Laramie. Now, let’s look at a few players that we should keep our eye on this Saturday. #21 Shaun Wick, RB- The junior RB picked up from where he left off after his breakout 2013 sophomore season, where Wick ran for nearly 1,000 yards and 9 TDs. From the first play of the game Wick showed that he was on a mission last Saturday. Wick was literally dragging Montana defenders down the field when he got the ball, as you can see here, here, and here. When the game was said and done Wick finished with 22 carries, 134 yards, and a TD. He ran the ball extremely hard and showed us why he praised the hiring of Coach Bohl and his style, he even tweeted saying that his prayers were answered. I would expect Wick to continue to run hard and his mate in the backfield, DJ May, looked like the perfect compliment and has the potential to be a home run hitter, like he was on Saturday. The two combined for 227 yards on 35 carries and scored Wyoming’s only two touchdowns. If they run loose Saturday night the Pokes will be right where they want. #21 Mark Nzeocha, LB- The German senior, Nzeocha (en-ZAH-chuh) enjoyed his best game as a Cowboy against Montana last Saturday. He finished the game with 12 total tackles, 3 passes defended, and 1 huge sack on 4th down in the third quarter. His great game earned him the MWC Defensive Player of the Week, the first of his career. Nzeocha’s talent has been undeniable since he came to Laramie, he has a unique blend of speed and size that you don’t see every day. That size and speed will be on display on Saturday as the Cowboy defense goes up against the Air Force option. Last year against Air Force Nzeocha recorded 7 tackles, including .5 TFL. He seems to be a perfect fit for Coach Bohl’s Tampa 2 scheme, which should have him poised for some opportunities Saturday. Wyoming’s defense needs to create turnovers, they missed some chances last week and that needs to change this week. Offensive Line- I don’t think there is any question that the X-Factor for this football team is going to be the offensive line, particularly in the pass-blocking department. Senior quarterback Colby Kirkegaard was sacked 6 times, lost 1 fumble, and threw 1 pic. Some of that is on him, but he was under pressure from the very beginning, which didn’t allow him to ever get comfortable in the pocket. 7 different OL saw action against Montana and I would expect them to continue to rotate guys in until they see something they are confident to stick with long term. Air Force’s defense wasn’t able to cause a turnover in their blow out win, but they did come away with 5 sacks. I don’t think their line is better than what Wyoming saw from Montana, but it will be another test for an OL that has a lot of question marks. If they hold their own and give Kirkegaard some time to throw things could look a lot better and Wyoming should be able to put up more points. #28 Jacobi Owens, RB- Owens was the man last Saturday for the Falcons. He finished the day with 23 attempts for 233 yards, but no scores. He will get the majority of the carries on Saturday and if a Cowboy defender misses their assignment when he gets the ball he will likely make them pay. As a team, Air Force gained 553 yards on the ground, while only losing 14 for a net total of 539 yard on 73 attempts (7.4 yrd/car). Wyoming knows the key to beating Air force is finding a way to get them in 3rd and long situations and they will need to slow down Owens early and often to make that happen. This will be a huge test for a Wyoming defense that looked tremendously improved from a season ago and only allowed Montana to gain 42 yards on 17 carries. #8 Weston Steelhammer, DB– Steelhammer only had two tackles in AFA’s win on Saturday, but they were big ones. They were both for losses that for a total of -13 yards. He also got the credit for Air force’s first 2 points of the ball game when he came up with a safety in the first quarter. Steelhammer is listed as a DB, but from what I have seen, they like to play him in the box and see if he can make plays that way. You may not hear his name often on Saturday, but if and when you do, it may be because he made a big play. He has already shown that he has a knack for that early this season. #2 Kale Pearson, QB- Kale Pearson was noticeably absent when these two teams met up last season in Colorado Springs. He injured his knee in his first career start last season and missed the remainder of the year. This is a big reason why Air Force struggled last year. Against Wyoming alone they played 3 different quarterbacks. Pearson had a nice day against Nicholls last Saturday, he ran the ball for 46 yards on 8 attempts and found the end zone 4 times. He was also 3-6 for 12 yards passing. As an option quarterback he will be a key factor on virtually every play. What I think makes him the true X-Factor is that Wyoming will be focused on the run and they appear to have a pretty stingy run defense, with a quick and experienced front 7. This means Pearson will more than likely have to drop back to throw the ball a few times. What happens when he drops back could determine the game. If he throws a couple touchdowns and catches Wyoming’s DBs sleeping the Cowboys could be in trouble. But if he is constantly having to throw in 3rd and long situations, Wyoming’s vicious pass rush should be able to apply a lot of pressure increasing the likeliness of a turnover and maybe swinging the game in Wyoming’s favor dramatically. *Interesting note none of these 3 players showed up in the box score when these two teams met last season.